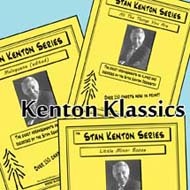 Festival 3-Chart Program - "Kenton Klassics"
Your audiences will absolutely love these 3 classics from the Stan Kenton Orchestra Library! These charts are packed with plenty of solo space, great ensemble writing, and, of course, the opportunity for your trombone section to shine. All of the charts are arranged and adapted for standard big band instrumentation. Adapted to be played with standard big band instrumentation, Bill Holman's arrangement of this exceptional tune is a fiery and energetic classic that the Stan Kenton Orchestra is known for. This great Latin chart has solo space for trombone (written) and tenor (improvised). A closer to bring your audience to their feet!